Where Aaron *Head* Moss and his guest hosts (among them are Pat Sampson, Jarrod Alberich aka The Yard Sale Artist and Kevin Reitzel) take a monthly look at the G.I. Joe: A Real American Hero comic book series, published first by Marvel Comics, then IDW. They also look at the cartoon and other related material. This time, Aaron, Ryan, and Kyle talk about Free Comic Book Day. To introduce everyone to the joys of reading comics. To call back former comic book readers. To thank current comic book buyers for their continued support. Publishers produce special edition comics geared to attracting new non-comic readers. There is a wide diversity of comics available, from traditional comics fare like Archie and Disney, super-heroes from Marvel and DC, manga from Tokyopop, as well as work from independent publishers. Visit your local comic book shop. At about 25 minutes in, they then cover the 9th issue of G.I. Joe. At 50 minutes in we mover over to the G.I. Joe cartoon, where this month we look at the second episode of the second mini series, The Revenge of Cobra. This episode is entitled "The Vines of Evil". This episode first aired September 11, 1984 and was written by Ron Friedman. As usual, also let us know what you think of this episode. We can be reached at gijoe@headspeaks.com. You can also e-mail us a MP3 file, which we will play on the air. 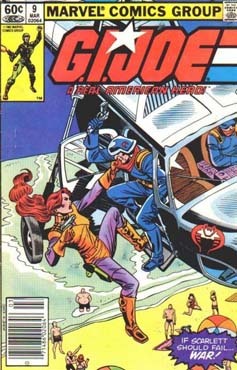 As always, we can be found here at http://gijoe.headspeaks.com and over on iTunes and Stitcher radio. On the right side, you can find links to pages containing other works of Aaron *Head* Moss, Ryan Daly, and Kyle Benning. Check out our other fantastic podcasts. Please send us your thoughts and concerns to gijoe@headspeaks.com. If you want to send us an MP3 with your comments, feel free to do so and we'll play it on the air. G.I. Joe is owned and trademarked by it's respective copyright holders. We make no money from this Headcast. We just want to spread the love of G.I. Joe with the podcasting world! Join us next month for our next episode of G.I. Joe: A Real American Headcast, as we talk about G.I. Joe: A Real American Hero, issue 10 and the third episode of The Revenge of Cobra! First and foremost, I do NOT work for Marvel Comics, IDW nor Hasboro and do NOT claim to speak on said company's behalf. All opinions expressed in this blog are my own. Please direct questions about Marvel Comics publishing schedules and business decisions to http://marvel.com/corporate/contact. For IDW visit: http://www.idwpublishing.com/contact. For Hasboro go to: http://corporate.hasbro.com/en-us/contact. All images on this blog (unless otherwise noted) are the property of Marvel Comics, IDW or Hasboro. All images (not belonging to Marvel Comics/IDW/Hasboro) will be credited (to the best of my ability) to the original owner and/or photographer. If there is an image on this site that you own that you wish to have removed, please contact me and I will be happy to cooperate. If there is an image on this site that you own that you feel was not credited to you, please contact me and I will be happy to cooperate. Copyrighted images appearing on this blog fall under the Fair Use legal doctrine as outlined by the United States Copyright Law. Copyrighted images in this blog will be used in commentary and research with the intention of advancing knowledge or the progress of the arts through the 'addition of something new'. Additionally, as per sections 29, 29.1 or 29.2 of the Copyright Act of Canada, this blog exercises Fair Dealing for the purpose of research, education, parody and/or satire. 2019 Headcast Network. Awesome Inc. theme. Powered by Blogger.